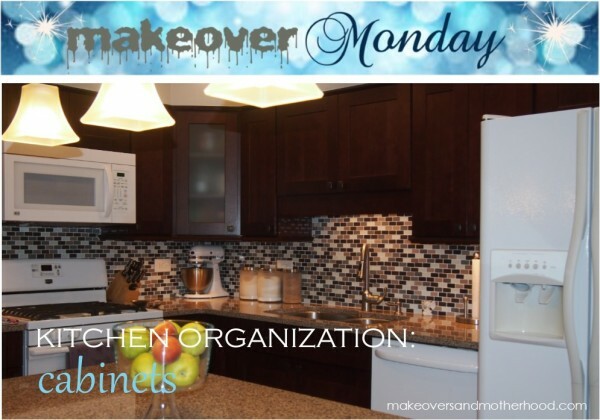 If you went through the Kitchen Organization series with us this past month, you have organized your refrigerator and reorganized your pantry and countertops. Do you have anything from those items that you now need to consider when planning your cabinet space? Keep them in mind as we go through the following steps. Is it easy for you (or anyone else using your kitchen) to find items? 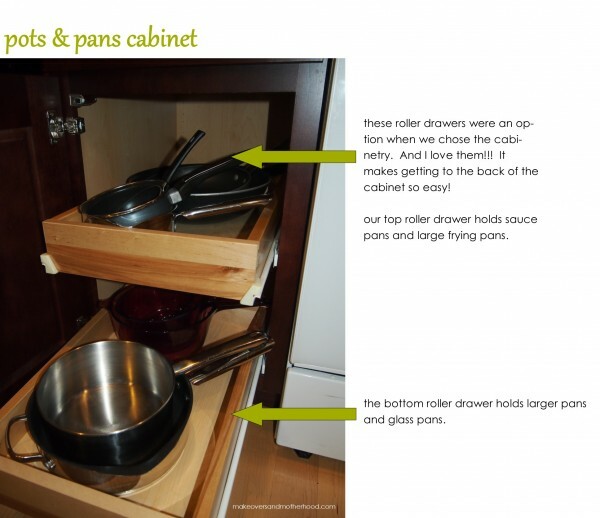 Do all of your dishes/pots & pans/cooking utensils fit nicely and/or neatly into your cabinets? How does your cabinet organization align with your countertop functionality? In other words, are the items you use for food prep handy/accessible in the cabinets close to your work area on the counter? Do you use everything in your cabinets? Also, ask your spouse or kids or anyone who regularly cooks in your kitchen their input in how to make it function more efficiently. Ask if they are able to find everything okay. Get their opinion on items you are iffy on keeping. Explain to them your goal in wanting to organize the space and see what ideas they may have. Make a plan! Remember that the goal in reorganizing your cabinets is to make better use of your space and to make your storage areas coherent with your work areas. Even if you’ve lived in your house for years, it makes sense to “tweak” your kitchen and make it as efficient as possible for you. Once again, you may want to make a sketch or a list of items for those “difficult” cabinet spaces. Do you have another area where you can keep large cumbersome items that you rarely use, but aren’t ready to purge? For instance, I LOVE my bread machine, but rarely use it. So it has found a home in the storage room in our basement where I still have access to it, but it doesn’t take up my valuable cabinet space. Put rarely used items in non-primary spots. Margaritas and wine are on my favorite things list. It doesn’t make sense to put the large glasses in a prime shelf location though. 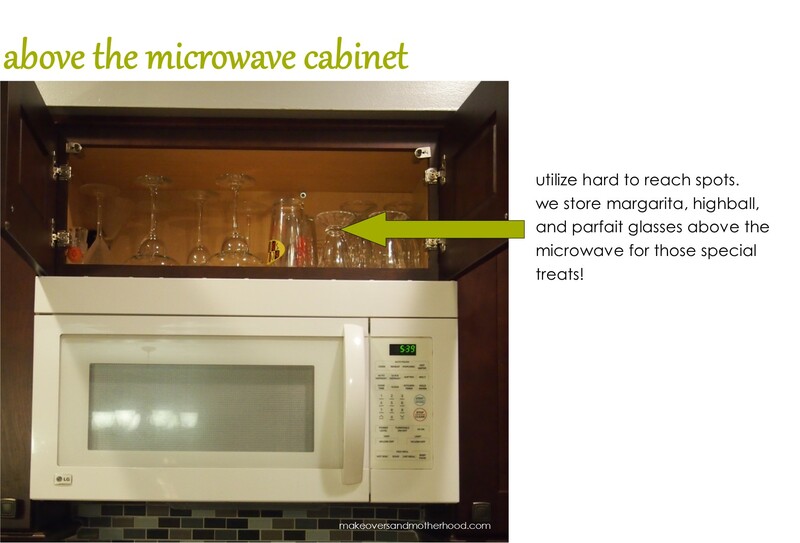 So my ‘rita glasses sit above the stove and microwave next to our ice cream sundae parfait glasses. Yes, if we want a sweet treat we have to work a little to get to it, but it is definitely worth it. 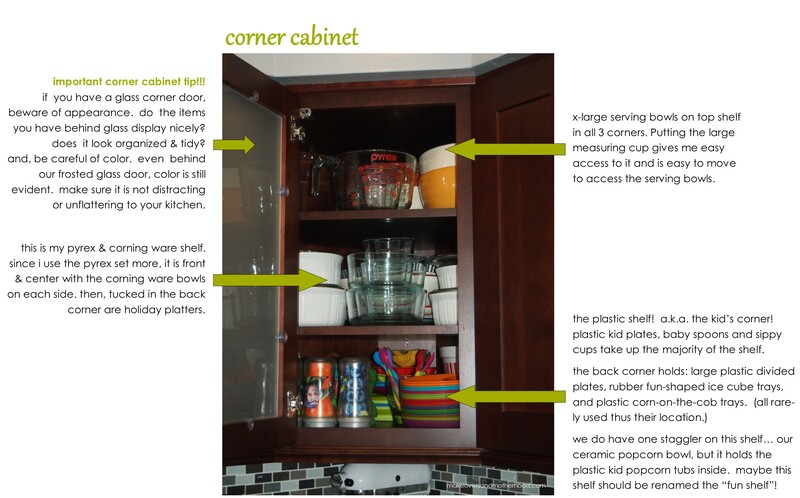 Speaking of corner cabinets… don’t forget the lower corner cabinet. Our lower corner cabinet is set up with a double lazy Susan and I love it! This space is great for small appliances that might otherwise take up precious counter space. I’m talking about things like toasters, crock pots, food processors, apple peelers, hand blenders and mixers. Plus, this is a great place to store large bowls too! 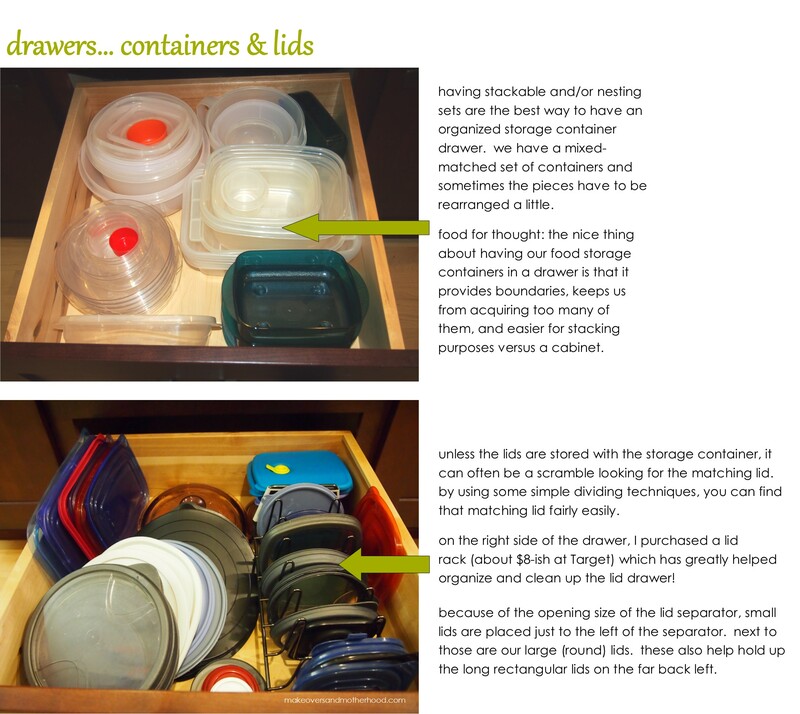 Here are some ideas on how I have organized our cabinets. Hopefully you can get some ideas that would work for you. Clean! Unload your cabinets. I would suggest doing one cabinet at a time. You don’t want to completely destroy your kitchen space and overwhelm yourself. 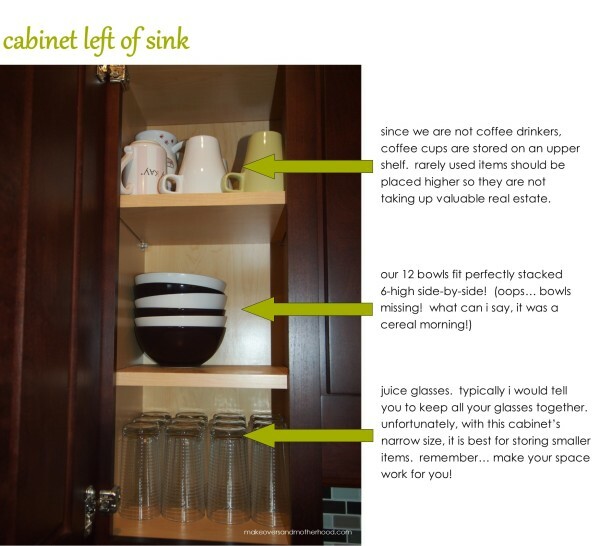 As you unload from your cabinets, separate out the items you no longer need or use. This is an important step so that you are not tempted to reshelf those items again. Give the cabinets a good wipe down and cleaning. Start fresh! Reload the cabinets. Don’t be surprised if you have to rearrange a couple times. An item may take up more space than you had planned so work with it. But still try to keep your boundaries. Bowls go here. Glasses go here. Keep like items together! You know I tend toward the OCD side and have to have each area completely defined with everything lined up and orderly. Anyways, pretend I’m in your kitchen with you. Define those areas. Have clean lines in your cabinets. Make me proud. Congratulations! You have completed the Kitchen Organization series! I hope your kitchen makes you feel more productive and is more spacious and well put together!